Is there anything... anything at all that the Swedes aren't good at?!! Maybe we should challenge them to a race down a steep Gloucestershire hillside whilst in pursuit of a 9lb round of cheese? There again, they would no doubt emerge victorious in that too... and even accomplish it whilst simultaneously juggling a pair of pickled herrings!!! Not only are they amongst the leading proponents in regards to Melodic Rock/AOR these days, but they can diversify and master other genres too, in this case Progressive Rock. A Secret River began life as a duo almost a decade ago; however, founder members Andreas Ålöv (vocals, bass, keyboards) and John Bergstrand (drums, percussion) have now been bolstered by the arrival of Mikael Grafström (guitar) and Björn Sandberg (keyboards) to craft a rich, atmospheric and serene soundscape that I feel justified in describing as "Soft Prog". 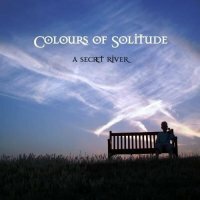 'Colours Of Solitude' is an aptly named title, and as the album cover beautifully illustrates, it has the ability to inspire introspective thinking whilst the sonic spectrum of sounds wash away life's negativity – yes, it's that kind of album; think Pink Floyd, IQ, The Tangent and Mike Oldfield, but in their most tranquil guise. There are no twenty minute songs overloaded with lengthy, and often pretentious, solos here (the longest is eight minutes) but what we do have are eight songs that each make their entrance wearing Hush Puppies and a reassuring smile. Don't get me wrong, this isn't a snoozefest, but it could be if total relaxation is what you're looking for. Opener 'Blinding Light' immediately lays the proverbial cards on the table with its self-effacing ambiance, intimate vocal delivery and delicate keyboard passages. 'No Way To Say Goodbye' and 'Starbomb' are my personal highlights; '...Goodbye', with its throbbing bass rhythm and Tangent-like instrumentation begins to breathe life into proceedings – the Steely Dan-like, semi-Jazz fusion mid-song is a trait I'd like to see developed in the future. 'Starbomb' meanwhile features quality guitar picking reminiscent of such Prog greats as Marillion and Genesis, and a melody that is impossible to dismiss. The instrumental title track is a song that serves its purpose well, and replicates its very name, and, as throughout the album, the keyboard phrasing and articulation are impeccable. I must finally mention 'Passing Grace' which has a Rockier edge that I'd also like to see more of. 'Colours Of Solitude' is a well-crafted debut from which A Secret River can build. It reminds me of a stunning, aromatic bunch of flowers that stops just short of coming into full bloom. However, it will meander melodiously into your soul and impress you... eventually.